Do Hedge Funds Love AptarGroup, Inc. (ATR)? Insider Monkey has processed numerous 13F filings of hedge funds and famous investors to create an extensive database of hedge fund holdings. The 13F filings show the hedge funds and investors’ positions as of the end of the third quarter. You can find write-ups about an individual hedge fund’s trades on several financial news websites. However, in this article we will take a look at their collective moves and analyze what the smart money thinks of AptarGroup, Inc. (NYSE:ATR) based on that data. Is AptarGroup, Inc. (NYSE:ATR) a bargain? Prominent investors are unambiguously in a bearish mood. The number of long hedge fund investments shrunk by 5 lately. ATRwas in 12 hedge funds’ portfolios at the end of the third quarter of 2016. 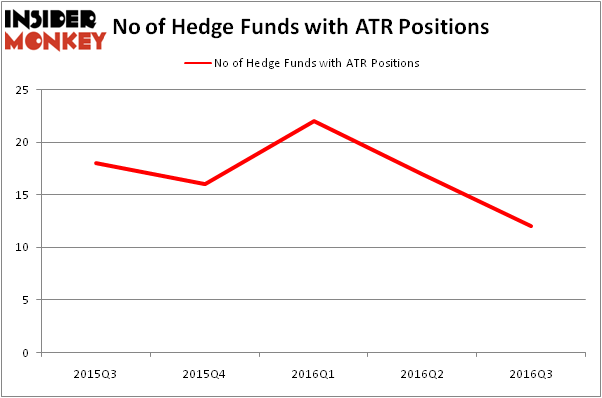 There were 17 hedge funds in our database with ATR holdings at the end of the previous quarter. The level and the change in hedge fund popularity aren’t the only variables you need to analyze to decipher hedge funds’ perspectives. A stock may witness a boost in popularity but it may still be less popular than similarly priced stocks. That’s why at the end of this article we will examine companies such as Ares Capital Corporation (NASDAQ:ARCC), Communications Sales & Leasing Inc (NASDAQ:CSAL), and Bemis Company, Inc. (NYSE:BMS) to gather more data points. Keeping this in mind, we’re going to take a look at the fresh action regarding AptarGroup, Inc. (NYSE:ATR). Heading into the fourth quarter of 2016, a total of 12 of the hedge funds tracked by Insider Monkey held long positions in this stock, a drop of 29% from one quarter earlier. On the other hand, there were a total of 16 hedge funds with a bullish position in ATR at the beginning of this year. With the smart money’s sentiment swirling, there exists a select group of key hedge fund managers who were upping their stakes substantially (or already accumulated large positions). According to publicly available hedge fund and institutional investor holdings data compiled by Insider Monkey, Chuck Royce’s Royce & Associates has the most valuable position in AptarGroup, Inc. (NYSE:ATR), worth close to $32.3 million, corresponding to 0.2% of its total 13F portfolio. Sitting at the No. 2 spot is Citadel Investment Group, led by Ken Griffin, holding a $17.7 million position; the fund has less than 0.1% of its 13F portfolio invested in the stock. Other hedge funds and institutional investors with similar optimism comprise Renaissance Technologies, one of the largest hedge funds in the world, Phill Gross and Robert Atchinson’s Adage Capital Management and D. E. Shaw’s D E Shaw. We should note that none of these hedge funds are among our list of the 100 best performing hedge funds which is based on the performance of their 13F long positions in non-microcap stocks.